The ICCF Congress 2006, in conjunction with meetings of the ICCF Executive Board and Management Committee, took place in the Ramada Hotel, Dresden, Germany. Participants of the Congress and accompanying persons were offered an extensive programme of events, including a boat trip on the River Elbe to Sächsische Schweiz in the Bastei region and then to Die Festung Königstein. There was a special visit to the grave of Hans-Werner von Massow and to the City of Dresden and an excellent programme for ladies and families, was provided by the host organisation. Opening the Congress, the ICCF President Med Samraoui responded to the warm welcome by Dr Fritz Baumbach BdF President, Mr. Lehmann, Mayor of the City of Dresden, and Mr. A. Schlya, the President of the German Chess Federation. The ICCF President referred to the cultural diversity of the City of Dresden, which was currently celebrating its 800th anniversary, and how pleased he was that ICCF was holding its 2006 Congress in such a fine City, which would also be hosting the FIDE Congress and Olympiad in 2008. He informed delegates that it would be the 6th ICCF Congress to be held in Germany, mentioning that the previous ones had been in Leipzig (1960), Berlin (1968), Munich (1978), Bad Blankenburg (1990) and Bad Neuenahr (1996). The 1996 Congress had seen the start of a transition to a new generation of younger officials and this would be perpetuated into the future. The President referred to the unique history of chess in Germany and its famous players and German correspondence chess had an even richer heritage. It had happened due to the immense contribution made by Hans-Werner von Massow, who was ICCF President for 27 years, and creator and editor of the renowned CC magazine Fernschach. Germany still occupied an impressive position at the top of ICCF playing countries, with the largest number of active participants. It had produced two World CC Champions in Horst Rittner (WCVI) and Dr. Fritz Baumbach (WCXI) both of whom were present, there had been 15 European Champions, 4 ICCF World Cup winners and the German team had won 3 Gold medals in Olympiads and the Ladies team had won 3 Silver medals. He congratulated BdF on achieving its 60th Jubilee and he was particularly happy about the success of its international World Open, which would start with circa 800 players. The ICCF President then referred to the sad passing of Mr. Hermann Heemsoth, who had died earlier in the year at the grand age of 9?? Hermann had been BdF President from 1956 until 1988 and had become a GM at the age of 78, the oldest player in the history of ICCF to achieve the title. Hermann attended his last Congress in 1999 but had been active since then, publishing correspondence chess games in various CC magazines. The ICCF President also reported the recent sad death of Alfonsino Lannaioli (ITA) at the early age of 55, who would be remembered by delegates who met him during the 2001 Congress in Rimini. 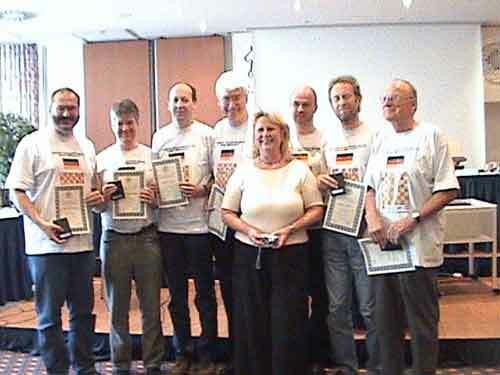 Other CC friends who had died were GM Enrico Paoli (ITA), Gaspar Darwin Soria (ARG), Mrs. Raimondi (FRA), Shigeo Hayakawa (JAP), Paul Darmodray (UKR) and Czsaba Meleghegy (HUN). Delegates stood in silence to the memory of all these and other departed CC friends. The ICCF President emphasised that his main focus would be to initiate and implement reforms which were needed to improve ICCF performance and give a better service to CC players. He mentioned he had been unable to attend the 2005 Congress due to travel problems and therefore wished to express his thanks for his appointment and appreciation to those who had helped him, on becoming President. He intimated that good progress had been made on some very important issues and expressed thanks to Michael Millstone for delivering the Direct Entry system, which was already bearing fruit. He thanked Martin Bennedik for his excellent systems programming work for the Webserver and Franklin Campbell (USA) and Gino Figlio (PER), for the webserver tutorial and guidelines and for operating the helpdesk. Although aspects of the ICCF financial situation remained unsatisfactory, he thanked Ruth Ann Fay for her efforts in handling accounting matters, since the resignation of the previous ICCF Finance Director. The President referred to the lack of contributions for the webzine ICCF Amici and urged all delegates and officials to contribute more articles to assist in the promotion of ICCF. He referred to tremendous marketing opportunities available and that much more urgency was needed in evolving and activating an ICCF marketing strategy. The ICCF President referred to difficulties of the last two years since his predecessor had resigned and to many vacancies which had arisen in key positions. He stated that many good officers had resigned, but thanked those who would be leaving this year, including Deputy President & Development Director Max Zavanelli (USA) and Title Tournaments Director Daniel Finkelstein (ARG). Michael Millstone (USA) had also resigned as Finance Director, but would be continuing as Direct Entry Co-ordinator. He referred to the issue of non-participation of an ICCF team in the FIDE Olympiad and to the need to improve relationships with FIDE into the future. The ICCF President emphasised the very important proposals which the President’s Council had made concerning updating of the ICCF Statutes and some other important topics. He hoped that there would be very constructive discussions and decisions taken on the proposals, during the Dresden Congress. He referred to the creation of a proposed ICCF Anthem composed by Dmitry Lybin (BLR) which would be played during Congress and hopefully thereafter adopted as the official ICCF Anthem. Expressing his hope that all delegates and friends would enjoy Dresden and a very happy and successful Congress, with a true Amici Sumus spirit prevailing throughout, the ICCF President declared the 2006 ICCF Congress, duly opened. The Membership and Services Director reported that Algeria and Ghana had applied for membership and they were approved by Congress and welcomed as the 65th and 66th members of ICCF. The ICCF President, on behalf of the Executive Board, proposed that ICCF Honorary Membership be awarded to: Iván Bottlik (HUN) both in recognition of their substantial contributions to ICCF and international correspondence chess for more than 25 years. The two proposals were carried unanimously, and with the acclamation of Congress. World Correspondence Chess Champions Ivar Bern (NOR) and Christophe Leotard (FRA) were awarded certificates and medals. Their trophies would be prepared for presentation at the 2007 ICCF Congress. Ms. Olga M Sukhareva (RUS), the winner of the VII Ladies World Correspondence Chess Championship, was awarded her certificate and medal. The Bertl von Massow medal in Gold was awarded to: Per Söderberg (SWE, Fritz Baumbach (GER), Gianni Mastrojeni (ITA) and Georg Walker (SUI) for this meritorious work in the organization of ICCF for more than 15 years. The Bertl von Massow medal in Silver was awarded to: Karel Glaser (CZE), Pedro Federico Hegoburu (ARG) and Zdenek Nývlt (CZE) for this meritorious work in the organization of ICCF for more than 10 years.